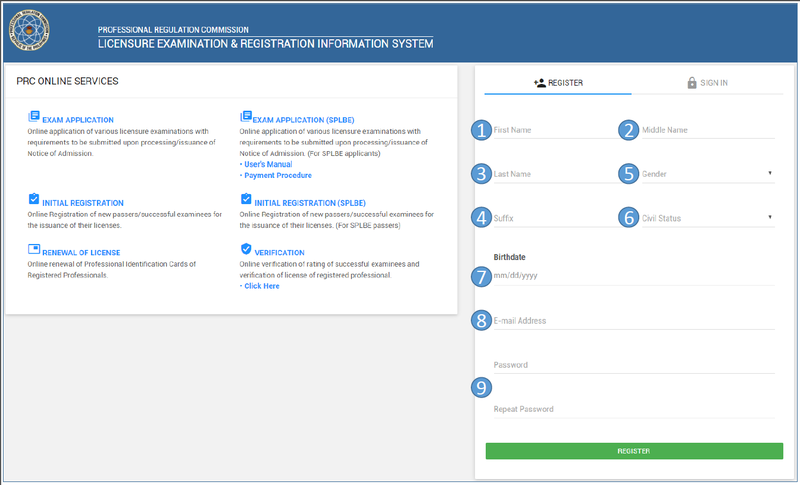 The Professional Regulation Commission (PRC) has now utilized and fully implementing the use of LERIS or the Licensure Examination and Registration Information System for its basic services from examination application, initial registration and renewal of PRC ID. In this article, the easy guide for PRC Online Application 2019 board examinations are discussed. 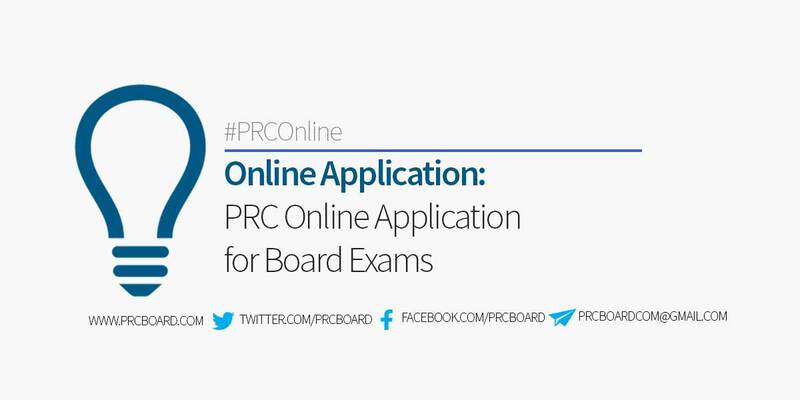 This includes the step by step procedures in the Online application for board exams of all PRC-regulated professions. Go to PRC LERIS or the online portal and follow below instructions. 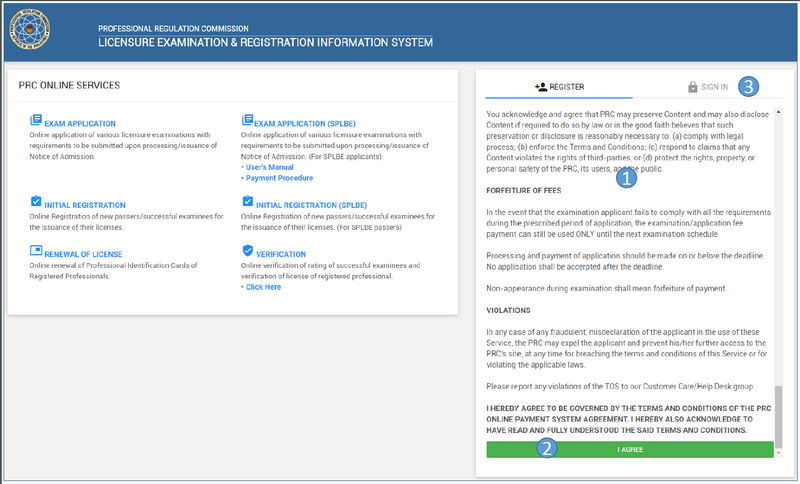 The step-by-step process for online registration board exams is courtesy of PRC. Please be guided accordingly. Online Initial Registration for Board Passers: How to Register? Online Renewal of License: How to Renew? REGISTER TAB. It's important to read the terms of service before proceeding and click the "I Agree" button. Make sure that before doing so, basic requirements like valid email address with password, mobile number, personal data including the date of graduation, ID photo in .jpg format saved in the local device as well as the valid ID card are in place. SIGN IN TAB. If the applicant already have an account, he/she may proceed to second tab, "Sign In" to proceed. The registration is straight forward. 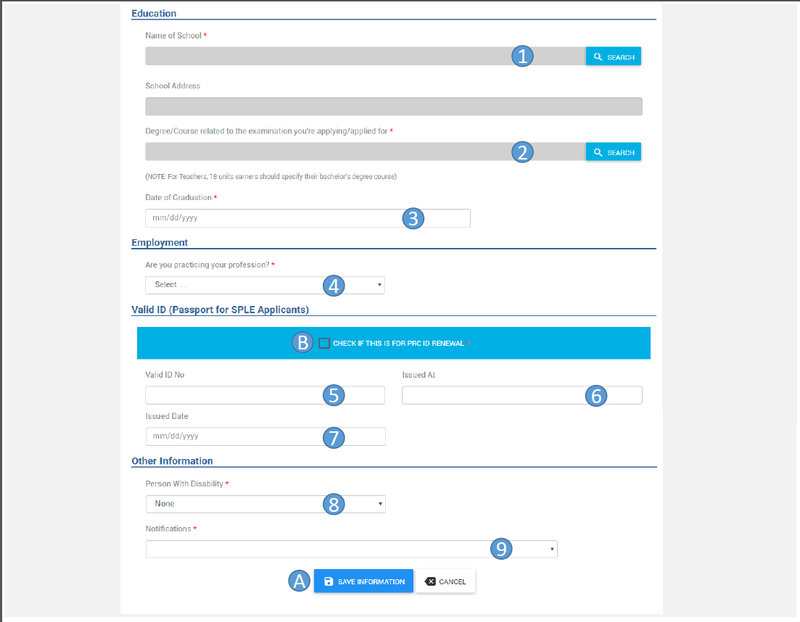 An applicant just have to input the required fields including the First Name, Middle Name, Last Name, Suffix, Gender, Civil Status, Date of Birth, email address, password and the verification of password. The password consists of six characters having letters, numbers and special characters. After correctly filling out the PRC online registration form. Click the "Register" button. There's nothing hard with signing in. Just make sure you remember your username (email address) and password and you're good to go. Remember your account details as you may also use this for initial registration and renewal of license. This is just a continuation of the Registration of Account. 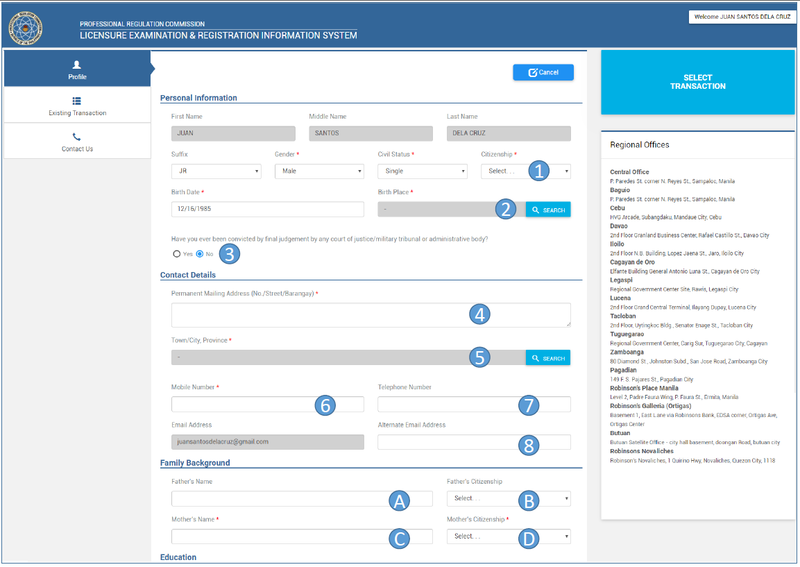 This is where the applicant completes his/her registration by providing the personal details, contact information, family background, educational information, employment information, among others. Specifically, for the basic personal details, the applicant must input the citizenship and birth place. In the contact information section, provide the permanent mailing address, town/city or province, contact number and alternate e-mail address. The name of the parents, father and mother as well as their citizenship are required in the family background section. In the Education section, choose the school attended, it's address, the degree related to the examination applying for as well as the date of graduation. If the applicant is employed, provide the details in the employment section. 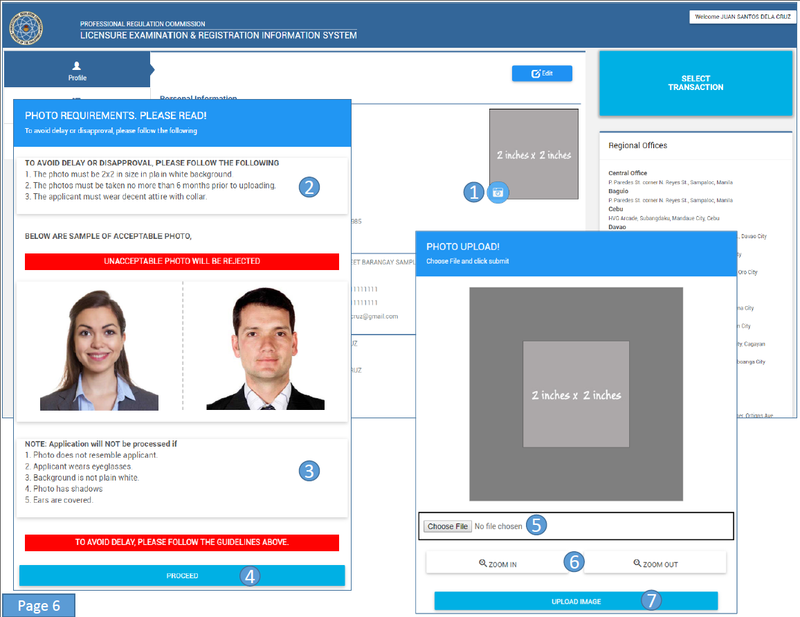 Other information asking if the applicant has disability as well as the options for notification are available at the last section. Save it by clicking the "Save Information" button below the form. no hassle, follow these guidelines for the photo. The photo must be 2x2 inches in size with plain white background. The photo must be updated, taken in less than six months prior to the target date of exams. The applicant must wear a decent attire, with collar. Unacceptable photos are those photos wearing eyeglasses, the background is not plain white, the photo has shadows and the ears are covered. Choose the file in the local device and upload. After uploading the photo, the next step is to pick the transaction. 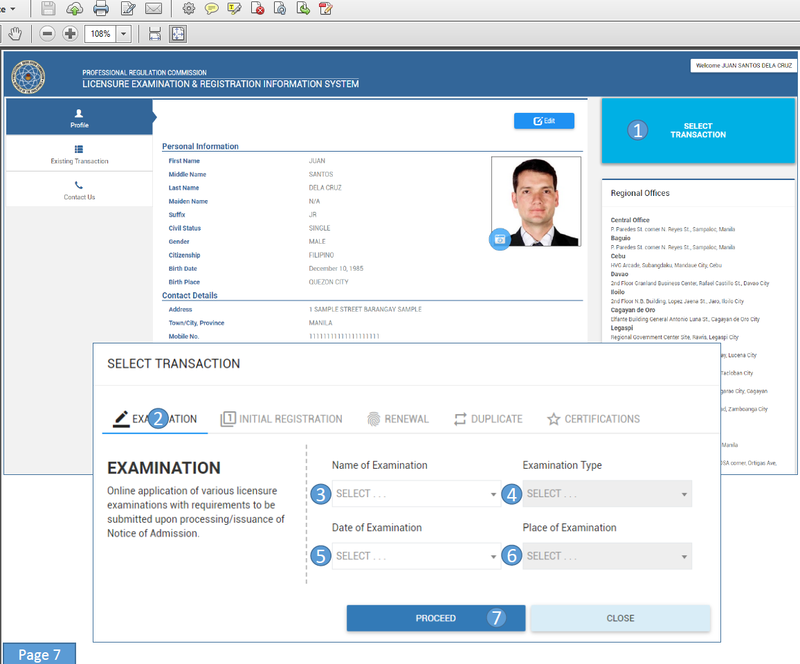 Go for the "Examination" tab, select the name of examination, the type of exams, date of exams and the venue. Then, proceed. After selecting the transaction, set the appointment and payment option. Select from the option the desired appointment venue, either at Central offices or at Regional office of your choice. 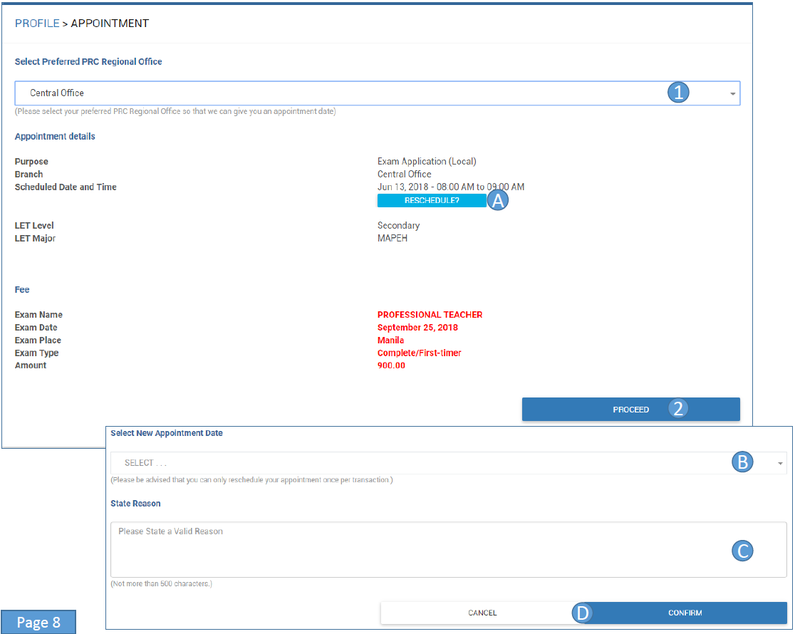 Should the applicant wishes to re-schedule the appointment, he/she can do so by clicking the "Reschedule" button. There, he/she can select a new examination date backed with a valid reason. After selection of appointment, proceed for payment. After setting an appointment is to select the payment option, either by Landbank or PRC-Cashier. Starting December 27, 2018, PRC announced that they are also accepting payments via UCPB (over-the-counter). The validation of payments is within 2-3 banking days. If the applicant chooses the Cashier option, then the payment will be made at the appointment place and time. Otherwise, if the applicant chooses the Land Bank e-payment portal, he may be asked to choose from the option to pay via Bancnet or Gcash. He/she then provide the Landbank account details including the account number and Joint Account Indicator and confirm the payment. 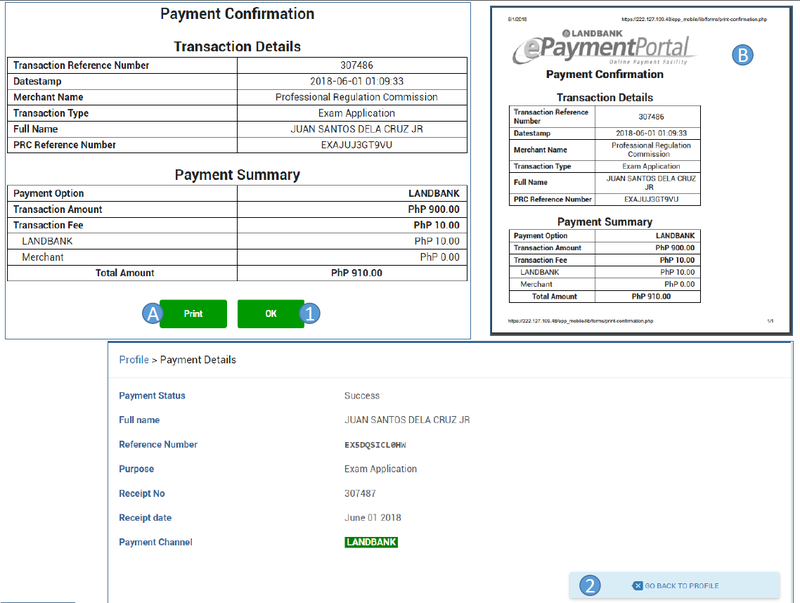 A fee of 910.00 pesos for paying through Land Bank e-payment. Have a copy of the payment confirmation and go back to profile to print the application form. 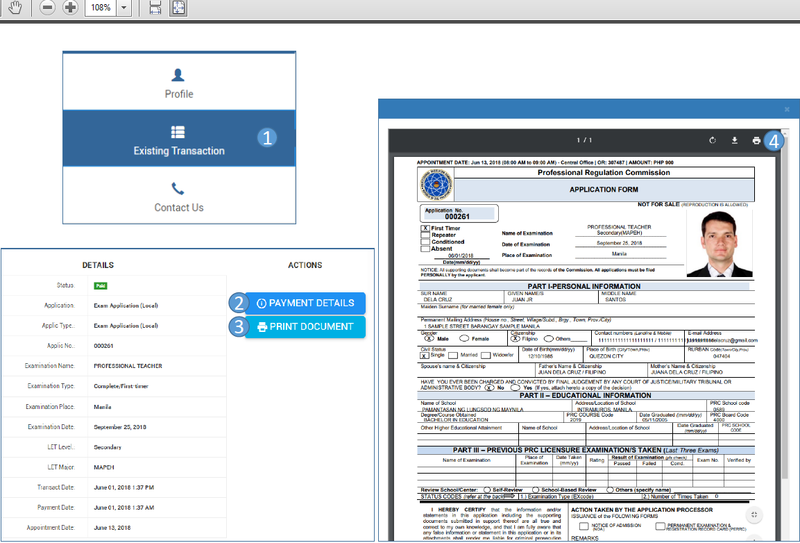 After payment, click on the Existing Transaction tab to check the status of payment as well as print the Application form. Head to the application venue on the date and time of appointment and don't forget to bring the printed application form as well as the additional requirements below. Shown below is the table of qualification and documentary requirements to accompany an application to take a licensure examination. All the procedures and images posted in this article are courtesy of the Professional Regulation Commission. The sole purpose of the post is to disseminate information so examination takers will know the step by step guide in applying for board examination online. Ma'am/Sir, When will be the exact schedule for Online Registration Application for 2016 Let Exam? i tried to apply online but hongkong and manila only is the only option for the exam place... what about other regions? me too. paano mo nagawan ng paraan? bakit po MANILA lang ang location? I'm stuck in authentication process. Pano po to? Anyone na may alam? Ano po ang gagawin kasi hindi matapos tapos yung transaction ko sa online, wala namang schedule na lumalabas..
hi whst if di nakasipot sa appointment schedule? Yong transaction po ba ng pagbayad sa bayad center ang magserve as official receipt of prc? 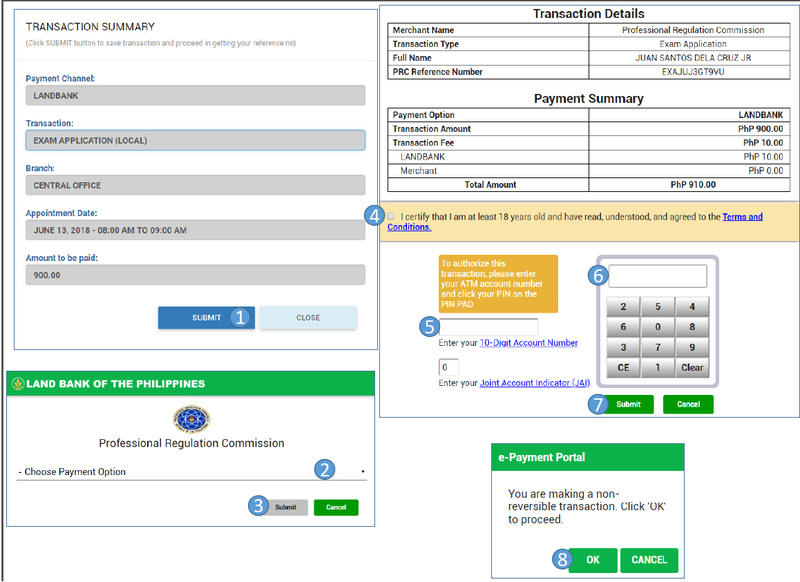 bkt di po ako maka log in I already register at nakapagbayad na rin po kailangan ko lang po ang form for registration e pa print paano ko po mapi print kung di po mabuksan kahit po e forgot password di pa rin po gumagana.haist ka ka disaapoint. Nabuksan mo na po ba yung account mo? Salamat po. Paano po if may mali sa naisend na application form, pwede pa po ba ma edit yun? Hope you will response my query. Thank you. God bless. Hi paano mo nai correct ang mali sa online application form mo? Hello po. Nakapagregister na po ako pero wala akong may natanggap na confirmation ng account ko sa email ko? Paano po ba to? Nakapagregister na po ako pero wala akong natanggap na confirmation sa gmail ko, paano po ba mapiprint yung registration form? Oo nga. Ano ho ba ang gagawin namin? Ask ko lang po, pwede po bang I.change ang appointment date na na set mo after filling up the application and after paying it? maam/sir bkit nd ako makapasok sa online registration? Why there I can't click the appointment date. I already select the branch, why I still couldn't. Anyone here who knows please tulong po. I can't remember po my password pano po ireset?? Pwede po bang mag direct na lang po sa PRC office instead of online.? Hi, i just created an account, when i clicked on the "select transaction" button and " examination" button i didn't find education or teacher etc. what does that mean? Bakit hindi po ma scroll down pagdating sa birth place? Hinding Hindi ko makompleto. Wala pong lumalabas na account verification sa email ko...paano po ito? what if wala kang government issued id? Bakit sa place of examination Legaspi lang ang lumalabas? Totoo po bang wala ng slot? Hello im from maguindanao, panu po mag online? Website Unavailable po kasi. Pag gina click ko ang LERIS V2 website. Thanks sa reply. bkt po unavailable pa po mg online..kelan po pwd?? Huhuhu. Bakit di pa rin maka online ? Good day po. I already have a registered account in the PRC Online System but I wasn't able to come to the set date of appointment due to conflicts relating work. Now I am trying to Sign In again to my account for LET 2018 but unfortunately I can't remember my password. Is there any way that I can retrieve or reset my password to a new one para magamit ko ulit ang account ko? Badly in need of help. Thank you! Same problem here. Nakapagbayad na po ako sa 7-11. Ano po ba ang dapat gagawin? Appointment date ko na po bukas. Wala pa po bang update sa prc online site? Nakadown pa po ba sila ? Bakit di pa rin makaonline? As June 6, 2018 at 8:04am, the PRC Online System is STILL under maintenance. There are no updates as to when they will be back to service. pwede ba magdirect na sa pr? ano po bang pwedeng gawin kasi pag nag sisign in ako wrong password and user name ang lumalabas? pwede po mag direct sa prc? wala po kasing available slot o date appointment na lumalabas, pls... reply po salamat. Applying po for Electronics Technician, kaso 4th yr undergrad pa ako. Ano po ang ilalagay sa date of graduation? bakit sa sa options gcash naman ang nawala? grabe naman yung site ng prc. Maam/Sir when will be the exact schedule for Online Registration Application for LET exam september 2018? maam/sir? bakit po unavailable parin yung online application? may nakita akong pwede mkapag sign in kaso wrong email at password daw..
Hi. Ask ko lang po if open po ang PRC every weekend? And until now offline parin po. Time is running po kasi. Pwedi po bang deretso PRC nalang amg apply for LET? Hoping for your great response. Thank you. Sir paano kung naubusan na nag slot sa let exam this september sa online pwede pa ba kami maka apply sir?? Offline pa rin till now.. hirap nito.. kailan kaya pwding magnonline? how to register for let exam?.. hello. the links you indicated in this article is mot working. When will this be available? Pahirapan nmn s pag online ngayun. Pwede po.b mag direct n s prc office for exam application kahit d nkapag online sched dahil under maintenance yung system? Pwede rin po b mag file here in legazpi for examination kahit s manila po magtatake ng exam? Ask lng po ako mam & sir..I am a secondary graduate pwede po ba ako mg exam sa elementary?please reply po..
BAKIT PO YUN ANAK KO NAGONLINE SA LET EXAM JULY 3 ,2018 KANINA LANG GCASH PO HINDI NAPROCESS ANG APPLICATION AFTER MAGBAYAD GCASH THROUGH LANDBANK? I have a reference number and appointment pero bigla ko na cancel paano ko po ibalik. Tanong ko lang po mga ma'am and sir nag bayad po ako ng 900 sa gcash kasi ayun ung choices pero ngayon minomonitor ko maya't maya walang nag aappear na bayad na ko. . I NEED SOME FEEDBACK PO PLEASE. BAKA KASI PAG KAORASAN NA NGA NGA AKO. Good morning, gusto ko lang po itanong kung bakit repeater ang nalabas sa information ko on the existing transaction kahit na first timer ako at first timer naman ang data na na input ko sa profiel. i have a friend with a similar situation. what do we need to do? who do we need to contact to fix the glitch? Good am.patulong naman po di ko na po maopen acct.ko na limutan ko na ata ung username at password.pano ko kaya yun marerecover? hello po, mag fifile ako ulit trying to log in using my prev account. pop up msg "unknown username and password"..o need na mag regster ulit ng new account?. Gagawa ako account po hindi successfull magregister (content://com.sec.android.app.sbrowser/readinglist/0904182205.mhtml) Ilan beses na .... 12 nn hanggang 7 am puwede magregister tama ba? hindi ko po ma open ang account ko dahil under maintenance lahat. Ano po gagawin?